This is the 2nd post in a new series here on my friends’ fabulous cooking! 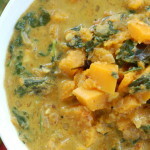 Last week, I put out a recipe for a butternut squash and spinach curry with coconut milk by my friend Jayanthi. So many people have already told me or messaged me that they have made the dish with great results! I got some questions about whether or not I tested the recipes myself too, and YES! All the recipes on this site, including on this series, are tested by me, more than once. Many times, recipes need to be tested over and over when it’s an original creation. In this case, I am testing a recipe that is already created, but since I like to publish well-written recipes (for YOU to be able to follow! ), I test these too in case I need to make the wording different or make things more specific. So next up! I want you to try this raita, which as you may know, is a savory yogurt-based side dish that accompanies a traditional Indian meal. If you’ve made a spicy hot Indian curry, this raita is meant to temper it, or it is fantastic just by itself with rice or pooris. The dairy is cooling on the palate and the spices in this case are already ground, so there’s no additional step you need to take. Most everything can be found at a regular grocery store, except the black salt (which is actually pinkish in color when ground and a little lumpy). Look for Himalayan black salt or as a fair substitute, some kind of pink salt or if you must, regular table salt but half the amount. The black salt, also known as kalaa namak, has a distinct mineral flavor, odor, and color, secondary to iron sulfides. It also is less salty because of slightly less sodium content. It is certainly used in many spice blends in Indian cooking, mostly in yogurt dishes and street side snacks like Indian chaat dishes. If you don’t have it on hand, no big deal, but one day buy a small amount –it will last for a very very long time in your pantry. Here’s the recipe, from my friend Rajal, who is a Gujarati woman just like myself, but her recipe is certainly more global and versatile than just a regional raita. 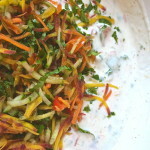 I really like this one because it’s an excellent go-to recipe for a traditional raita. She’s been serving it at her regular dinner parties for years and even took it on a big multi-family camping trip once when we had an Indian feast! 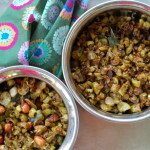 She makes an assortment of Indian dishes, mostly all versatile family-friendly dishes that are easy to tailor to your own family’s heat preference. Her recipe for this raita has a bit of chili powder in it and you can reduce or remove it if you wish, but I recommend at least a little bit to start with. Enjoy!! 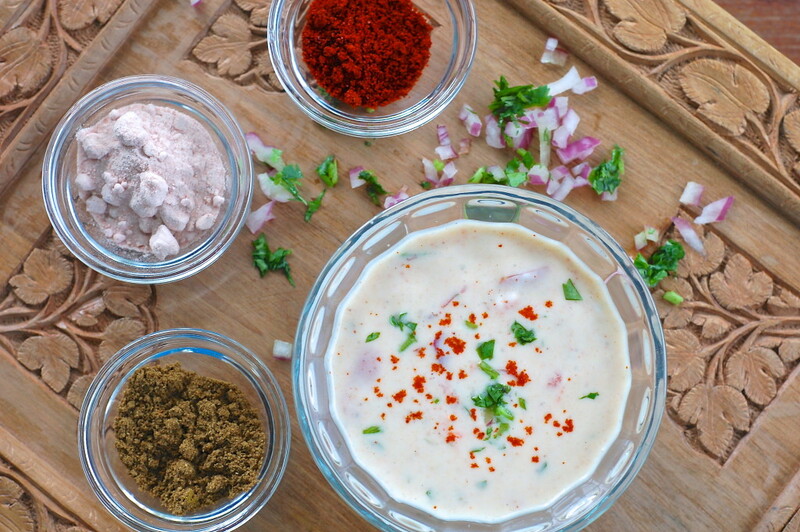 This recipe for a really good traditional Indian raita comes originally from my friend Rajal. The recipe makes over 2 cups worth which Rajal recommends for about 8-10 adults; however, some Indians like myself usually have at least one cup full of raita or plain yogurt with an Indian meal. 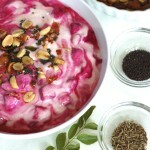 The yogurt recommended by Rajal is full-fat plain yogurt, as described in the recipe. However, the quantity of water you add significantly depends on the brand and consistency of yogurt you buy. I've made the recipe with 2 different brands (Maple Hill Creamery and Wallaby) as well as homemade. All 3 times, I only added ¼ cup water because it would have thinned the recipe too much if I added more, but this is entirely personal preference. I've specified that in the recipe below. Enjoy! In a small bowl, combine cumin, chili powder, black pepper, black salt & salt. 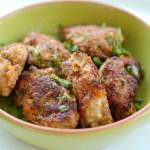 Use fingers to mix well, breaking up any lumps in the spice mix. 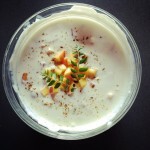 Whisk yogurt in a medium mixing bowl until you have a smooth consistency. Add water (add ¼ cup at a time to get desired consistency) and whisk again until completely incorporated. Add spice mix to yogurt and whisk well. Add tomato, carrot, cilantro, and red onion. Mix well. Optionally, dust with additional chili powder and/or cumin powder to give a pretty presentation (also cilantro).